I've been writing a lot this week about sustainable building products, and with each mention I refer to a store in Gainesville called Indigo. Indigo opened in May of 2007 and their mission statement reads: "Responsibly providing communities with state of the art sustainable solutions. Impacting our world through an innovative multi-faceted business that places people and planet alongside growth and prosperity. " 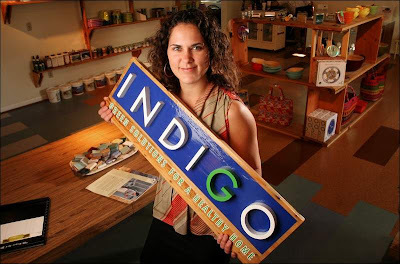 Indigo's vision is "Inspiring ourselves, the community and the world by sharing the secrets of a modern sustainable lifestyle." Indigo offers classes on sustainable construction that are open to both the trades and the public. Indigo's website reads like a sustainability Christmas List. Dual flush toilets, sustainable lumber, formaldehyde-free plywood, low VOC paints, non-toxic cleaning supplies --it's all here and a lot of it is available for sale through their website. These people are onto something, something big. I wonder what it would take to get them to open a location in Saint Pete? Hmmm. Never mind, but please look over their website. If you're planning a renovation, think about a trip to Gainesville to see this place for yourself.